The six short listed books for this year's Man Booker Prize were announced recently but up until today we haven't had many of the books in stock. Luckily local publishers have been reprinting/obtaining the books, and they've finally arrived. There's a mix of nationalities with two Canadians, two Americans, one Scottish and one British author and the list is equally split between male and female authors. There's one debut novelist, Ottessa Moshfegh, and also a crime novel, in Graeme Macrae Burnet’s His Bloody Project and, interestingly, all of the novels feature disturbed protagonists. 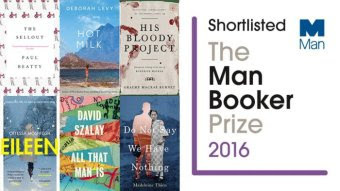 Deborah Levy is the only author to have been shortlisted for the Booker before for Swimming Home. The winner of the prize is announced in London 25 October 2016.